Zélie never lost her longing for the cloister yet she loved her husband and children, and totally fulfilled her role as both wife and mother. She was a highly skilled lace maker and an astute business woman. Zélie Guérin was born on December 23, 1831 in the parish of St-Denis-sur-Sarthon near Alencon; she was baptised on Christmas Eve. Her father had retired from the army and was a member of the local police force. Her mother had given birth to her first child, Marie Louise, two years previously and the family was completed with the birth of a son, Isidore, ten years later. Her father sold his house and land in the country in order to send them to school. The family moved to Alencon when Zélie was 13 and together with her sister, she attended the school of the Perpetual Adoration. After the move to Alencon her mother ran a café for a short time and her father tried his hand at woodwork. Later Isidore, who was a bright child, was sent to the Lycée. In adult life after studying medicine in Paris he became a pharmacist at Lisieux. Zélie suffered severe headaches in her childhood as well as respiratory problems, and it was probably on account of her poor health that the Sisters of Charity of St. Vincent de Paul would not accept her as a postulant when she applied to join them. Her sister entered the Visitation Convent at Le Mans at the age of 29, and became Sister Marie-Dosithée. On entering she declared, ‘I have come here in order to become a saint.’ Zélie’s plan unfolds Zélie had decided that if God did not want her as a religious she would marry and have many children who would all be consecrated to Him. She turned to Our Lady and asked her how she should earn her dowry. On December 8, 1851 she received her answer in the form of an interior voice which said, ‘Make Alencon point lace’. Zélie went to a professional school to learn her craft; she quickly excelled and left to start her own business. One day when she was crossing the Bridge of St. Leonard, Zélie noticed a man passing by and again heard that interior voice. It said, ‘This is he whom I have prepared for you.’ The man was Louis Martin, whose mother had noticed Zélie at the lace making school. On July 13, 1858 Zélie and Louis were married; she was nearly 27. On the evening of her marriage Zélie visited her sister at the Visitation Convent in Le Mans. She had been a postulant there for two months, but this was Zélie’s first visit to her and she could not stop weeping. She wished with all her heart that she could have entered too. Zélie was always totally content with Louis, Zélie’s agree to Louis’ proposal for chastity, even though she still wanted to bring up children for God. During the first year of their marriage they cared for a little boy of five whose father had died and whose mother had eleven children. They lived a life of chastity for ten months, after which, under the direction of a confessor they agreed that they should have children of their own. Once convinced that this was God’s will for them they had nine children in thirteen years. Meanwhile, Zélie set up her office next to Louis’ shop, where she continued with her lace making. The first baby Zélie’s first child was born on February 22, 1860, and given the names Marie Louise. Zélie and Louis had decided to give all their children the name Marie in honour of Our Lady, Marie had good health from the start, and proved to be the easiest of all the children to rear. On September 7, 1861 Marie Pauline was born; she too was a reasonably strong child, though she suffered from a chronic cough during her first years. Zélie’s third daughter Marie Léonie was born on June 3, 1863. Marie Hélène was born the following year on October 13. Zélie’s own health was already beginning to fail. She was unable to nurse this child herself and had to entrust her to a wet nurse. In April 1865 Zélie wrote to her brother, ‘You know that when I was a girl I received a blow in the breast, through striking the corner of a table. In June 1865 Louis’on September 20, 1866 she gave birth to Marie Joseph Louis. It was the easiest birth since her first child and the baby was big and strong. The little boy was very ill and on February 14, he died. Zélie believed she had a saint in Heaven. She turned to St. Joseph making a novena which ended on his feast day for another son. As when she asked Our Lady’s prayers for a second child, the baby was born precisely nine months later. Marie Joseph John Baptiste arrived on December 19, 1867 but his was the most difficult birth of all. Everyone could see that this baby was not strong. Zélie was resigned, he suffered enteritis and on August 24, 1868 he died in his mother’s arms. Zelie's father, unable to live alone, had been persuaded to move in with his daughter and her family. He died less than two weeks after her second son. On April 28, 1869 Marie Céline was born. Hélène fell ill tragically and unexpectedly; within forty-eight hours she died, aged only five. Marie Mélanie Thérèse lived less than two months. In July 1871 the family moved to Zélie’s old home. Zélie went to the 5.30 Mass there every morning with her husband; they both received Holy Communion several times each week, which was unusually frequent at that time. She had about fifteen women working for her. Zélie even dealt with investments and read the stock exchange journal. Having lost Hélène and Mélanie Thérèse, Zélie was delighted to find herself expecting her ninth child. On Thursday 2nd January 1873 Zélie gave birth to her last child, Marie Francoise Thérèse. The little brothers and sisters who had died were considered very much a part of the family and following Zélie’s own conviction the children were taught to look upon Heaven as their true home. In October 1876, doctors said the swelling in Zélie’s breast was A fibrous tumour’ and advised an operation. On February 24 her sister died at the Visitation. 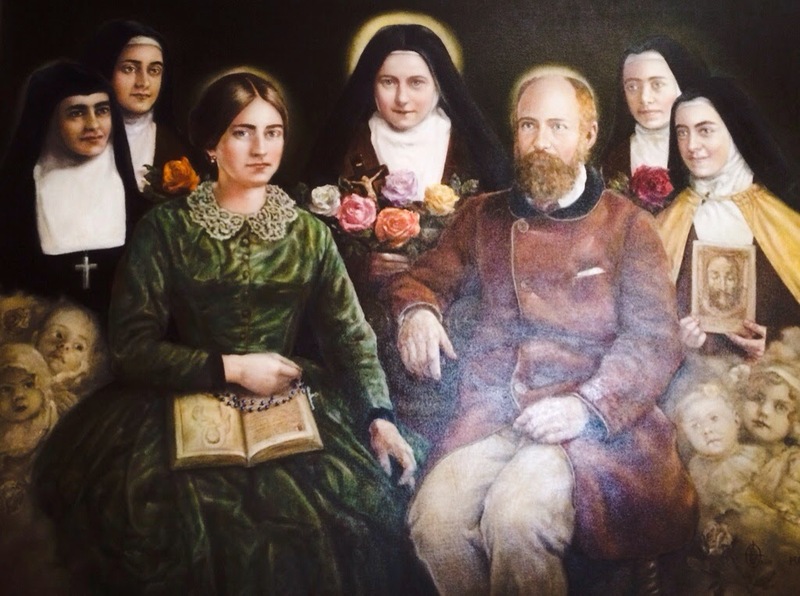 Zelie and 3 of her daughters set out for a pilgrimage for healing to Lourdes on June 18. Zélie fell and twisted her neck causing pain from which she never recovered. She was immersed four times in the baths, but her pain remained as severe a ever. Zélie arrived home in good spirits, even though her health was worse. She held on to Our Lady’s promise to Bernadette, ‘I will not make you happy in this world but in the next.’ At the end of June the tumour began to discharge; the nights were dreadful; the pain was so severe Zélie could not sleep. few more steps. On August 16 Zélie wrote her last letter to her brother, ‘If the Blessed Virgin does not cure me, it is that my time has come and that God wishes me to find my rest elsewhere than on earth.’ Ten days later a haemorrhage took away her voice, her limbs became swollen and she became so weak that the Guérins were summoned. Louis fetched the priest escorting the Blessed Sacrament from the Church. The family were all gathered round for this final ceremony. The next day the Guérins were there. Céline Guérin never forgot the mother’s last look; she resolved to do all she could for the children, but she knew she could not replace such a mother. On Tuesday August 28 at 12.30 a.m. Zélie died, her husband and her brother beside her. The three older girls were there, but they did not waken the two younger ones. Thérèse’s father took her to see her mother for the last time the next morning. The following day Zélie was buried with the four little ones. It was not until 1894 when Louis died that Isidore Guérin had the family grave moved to Lisieux. In 1957 the Cause for Zélie’s Beatification was introduced together with that of her husband. … The Cause of Louis and Zélie received a great boost when the Holy See officially recognised their heroic holiness and on 26th March 1994 they were declared Venerable by Pope John Paul II. Short Biography of Blessed Louis Martin Father of St. Thérèse Above the graves of St. Thérèse’s parents behind the Basilica in Lisieux are the words, ‘God gave me a father and mother more worthy of Heaven than of earth,’ words written by Thérèse to Abbé Bellière just two months before she died. Time has shown that Thérèse was not alone in believing this as their Cause for Beatification was introduced in 1957. Their heroic holiness was officially recognised by the Holy See when Pope John Paul II declared them Venerable on 26th March 1994. Louis’ family were from Normandy he was born in the south of France at Bordeaux. His father was a captain in the army garrisoned there, though he was actually away in Spain when Louis was born on August 22, 1823. Louis’ only brother, Pierre, was four years older. He died at sea while still young; his sister, Marie, who was three years older, died when she was only twenty-six. Louis was baptised privately straight after birth but the full ceremonies at the Church of St. Eulalie were not completed until October after his father returned from the Spanish campaign. He was given the names Louis Joseph Aloys Stanislaus. After his return from Spain Captain Martin was transferred to Avignon, where in 1826 another child, Anne Fannie, was born. She was the only one of the family besides Louis to have any children of her own; she married Adolphe Leriche and in 1844 gave birth to a son of the same name, but died nine years later. The youngest of Louis’ sisters, Sophie also died at age nine. The father chose to live in Alencon where he knew he could educate his children. In 1842 Louis began to learn watchmaking. In Strasburg Louis climbed the Swiss Alps to the Augustinian Monastery of Mount St. Bernard but to seek admission to the community. The Prior told him that without any knowledge of Latin he could not be accepted. He persevered for over a year, but when illness made it necessary for him to give up for a while he never returned to it. Master Watchmaker Louis returned to Alencon a master watchmaker and in November 1850 established his shop in the Parish of St. Pierre de Monsort. The house was large so Louis had his parents to live with him. He worked hard at his watchmaking and later added a jeweller’s shop. He insisted on closing his shop on Sundays even when a priest suggested that he might leave the side door open. In 1857 he bought the Pavilion, a small property on the outskirts of the town. He also liked fishing and he often took his catch to the Poor Clare Convent. He was generous to the poor and never hesitated to give practical help when he saw the need.When he was thirty-five, only three months after their first meeting, Louis married Zélie Guérin, on July 13, 1858. They lived behind his shop, and as the house was so large his parents were able to remain there, living quite separately on the floor above. Since Louis and Zélie both desired to live the religious life they chose to continue their dedication to God through chastity after their marriage. It was only ten months later, when a confessor suggested that they should consider the vocation of parenthood that their ideas changed. Louis was delighted when his first daughter was born on February 22, 1860. In the following thirteen years eight more children followed Marie; Louis rejoiced at each birth and sorrowed when three of them died as small babies, but his greatest sadness in those years was the death of five year old Hélène on February 22, 1870. That same year, in April, Louis sold his business to his nephew, Adolphe Leriche, and in July 1871 the family moved to Zélie’s old home. Louis’ mother continued to live above the shop, happy that her grandson now occupied the other apartment. Louis had always done all he could to help Zélie with her lacemaking business. With the birth of Thérèse in January 1873 Louis’ family was complete. He loved to spend time with his five daughters. Louis liked to go on pilgrimage to Our Lady’s shrines. At the end of 1876 when Louis realised that his wife was fatally ill he became inconsolable. He gave up his fishing for a time and would not leave her. On August 28 Zélie died and the following day Louis took his little Thérèse to kiss her mother for the last time. Louis was left with five daughters ranging in age from 4 to 17, Louis fulfilled his wife’s wishes and less than three months after her death the family went to live at Les Buissonnets in Lisieux, to be near her brother, Isidore Guérin, and his wife Céline. he returned to Alencon to visit his own mother and the family graves Marie ran the house helped by a maid. He still enjoyed reading and also passed much time there in meditation and prayer. He spent each evening with his daughters. Usually one of them read aloud from ‘The Liturgical Year’ or some other carefully chosen book. Céline and Thérèse often sat on his knee and he told them stories and sang to them. This was where Thérèse first heard many of the melodies that she later used as settings for her poems. The evening always ended with family prayer and Thérèse said that she only had to watch her father to know how the saints pray. He often spoke of Heaven and every day he assisted at the early Mass as he had done in Alencon. He established the Nocturnal Adoration Society in Lisieux with the help of his brother-in-law. He was active in the St. Vincent de Paul Society and each Monday he gave alms to the poor. Carmel takes Pauline When Thérèse began school at the Benedictine Convent it was often Louis who took and collected her together with Céline who was also a pupil there. When Pauline expressed her desire to enter Carmel he gave his permission willingly even though he was not at all sure that her health would stand up to the austerities of the life. Later that same day he said to her, ‘Pauline, I have given you permission to enter Carmel for your happiness, but do not think that there is no sacrifice on my part, for I love you so much.’ He was sorry to lose a daughter from the family circle which meant so much to him, but he was happy that the prayers he had made with Zélie that each child would be consecrated to God were being fulfilled. He knew that of all the girls Pauline had been closest to her mother and Zélie had been convinced that she would enter a convent. Now her wishes had come true. The following March Louis set off for Paris with Marie and Léonie to celebrate the Holy Week and Easter ceremonies there. Céline and Thérèse were left in the care of their aunt and uncle and during that time Thérèse became very ill. Louis had Marie send to Our Lady of Victories in Paris to ask for a Novena of Masses to be said for her recovery. It was during that Novena, on Pentecost Sunday, that Our Lady smiled on Thérèse and she was cured. Léonie soon decided suddenly to enter the Poor Clares however, was not strong enough to follow the austere rule of the Poor Clares. When Thérèse asked her father’s permission to enter Carmel, Louis was not so surprised, even though she was only fourteen. He went with her to see the Bishop and he took her, together with Céline, on a pilgrimage to Rome where she asked the Holy Father for the necessary permission. Léonie, this time with her father’s full permission, had gone to try her vocation at the Visitation Convent in Caen, but even though the Visitation was much less austere than the Poor Clares Leonie could not enter. By this time Louis’ health had deteriorated. Through most of his life he had been well and strong but one day when he was fishing near Alencon he was stung behind his ear by a poisonous fly. At first there was only a small black spot which did not trouble him very much, but over the years the infection spread. The year before Thérèse entered Carmel he experienced a paralytic stroke which affected his left side. The date for Thérèse’s Clothing in the Carmelite Habit was delayed because of Louis’ illness but it was finally fixed for 10th January 1889. He led Thérèse to her clothing. On February 12, 1889 Louis was admitted to the Bon Sauveur, hospital at Caen. In the hospital he had a considerable amount of freedom and he received loving care from the sisters. He spent much of his time in the Chapel and was able to receive Holy Communion daily when he was well enough. By this time Louis had suffered further strokes which had paralysed his legs. His daughter Pauline had been elected Prioress of Carmel. Léonie then entered the Visitation Convent at Caen again in June 1893. Céline alone remained with her father until his death, but she was greatly supported by the Guérin family. In 1888 they had inherited, together with the Maudelonde family, La Musse. On August 18 they returned to Lisieux. Throughout the following winter, Louis’ health remained stable. In May Céline went to Caen but while she was there on May 27 Louis suffered a serious stroke. Louis received the Last Sacraments. He seemed to be recovering again until June 5 when he had a serious heart attack while Céline was at the 7 a.m. Mass in the Cathedral. He suffered another, more prolonged heart attack on July 28 and again he received the Last Sacraments. Céline remained alone with her father praying the invocations to Jesus, Mary and Joseph for a happy death. Isidore Guérin Isidore pressed the crucifix to Louis’ lips several times. By this time his breathing had become very weak, and at a quarter past eight on Sunday 29th July 1894 he died. Louis’ body was taken back to Lisieux where he was buried on August 2 after a Requiem Mass in the Cathedral. Céline had written to her sisters in Carmel ‘Papa is in Heaven’. 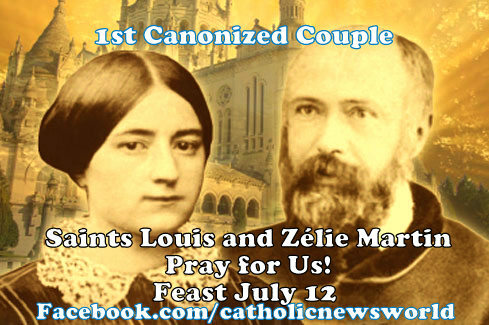 Prayer for the Beatification of Louis and Zélie Martin and to obtain favours through their intercession: God Our Father, we praise You for Louis and Zélie Martin, a truly faithful husband and wife, who lived their Christian life in an exemplary way through their duties in life and practice of Gospel teaching. In bringing up a large family, in spite of trials, bereavements and suffering, they showed immense trust in You and obedience to Your will. Lord deign to manifest Your will in their regard and grant me the favours I implore while praying that the father and mother of Saint Thérèse of the Child Jesus be presented as models of family life today. Amen. The Causes of Louis and Zélie Martin were drawn up between 1957 and 1960 in two separate processes whose findings were sent to Rome. These two Causes will now be examined according to the method of the historical process and form one single Cause so that this husband and wife may be Beatified together, should the Church so decide. The faithful are, therefore, invited to invoke Mr. & Mrs. Martin together for favours and miracles confided to their intercession.